The General William Tecumseh Sherman Monument was dedicated on October 15, 1903 at the intersection of 15th Street, Pennsylvania Avenue & Treasury Place, a site Sherman is reported to have stood while reviewing returning Civil War Troops in 1865. Originally commissioned in 1896 by the United States Department of War and the Society of the Army of the Tennessee, General Sherman Statue Committee at a cost of approximately $90,000, plans for the monument were submitted by Carl Rohl-Smith. Rohl-Smith died in 1900, and supervision of the work was continued by Lauritz Jensen, under the direction of Smith's widow, Sara. The monument features a 14-foot bronze equestrian figure of General Sherman, which was completed by Jensen, mounted atop a 42-foot high pedestal built by the Harrison Granite Company with granite furnished by the Fletcher Granite Company. The four sides of the pedestal are each adorned with a relief of a battle scene, finished up by Jensen. 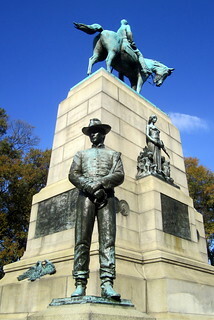 The reliefs on the east and west side are surmounted, respectively, by the bronze figure groups representing War and Peace, and flanked by two portrait medallions on each side, depicting generals who served under Sherman. The medallions were created by Theo Kitson. Both War and Peace were originally modeled by Stephen Sinding, but the figure of War, which was modeled after drawings by Rohl-Smith, was found not to harmonize with the rest of the monument and was remodeled by Sigvald Asbjornsen. At each corner of the base stands a life-size soldier represening each branch of the army--Infantry, Artillery, Cavalry, and Engineers. Rohl-Smith completed three of the four soldier figures on the corners of the monument and Asbjornsen completed the fourth figure, but sources differ as to whether it was the artilleryman or the cavalryman. All of the sculptures were cast by Gorham Manufacturing Company. A six-foot-wide mosaic encircling the base, listing the names of all Sherman's battles, was done according to Rohl-Smith designs and laid by the National Mosaic Company.